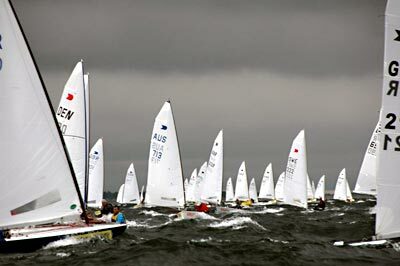 On Sunday night in Łeba, Poland, at the opening ceremony of the 2007 OK Dinghy World Championships, the class unveiled its 'Hall of Fame' as part of the class's 50th anniversary celebrations. OKDIA President, Greg Wilcox (NZL) introduced the initiative by saying, "As you all know we are celebrating the fiftieth year of the OK Dinghy. After all that time we have decided to set up a 'Hall of Fame' to honour some of the greatest OK Sailors ever. Obviously there has been quite some debate over what criteria would be used to select who would be inducted, but we hope it will eventually include not only the great sailors among us but also those who have contributed in many special ways to the class we all love." 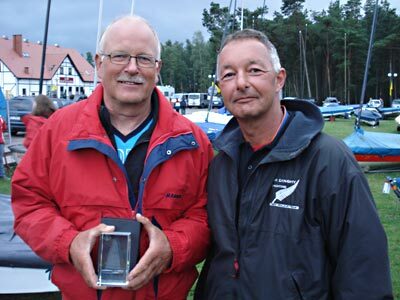 The OK Dinghy International Association (OKDIA) decided to bestow the honour of the Hall of Fame's first member onto long term OK Dinghy sailor Jørgen Lindhardtsen (DEN). Wilcox said, "We felt that the first OK sailor selected should be a person who is not only still actively sailing and who continues to encourage and inspire others within the class but also has a record that is pretty much second to none on the racecourse." He continued, "There is among us someone who is affectionately known as 'the old man', who has been sailing these great boats for 43 of those 50 years. His record of 14 top ten places in the Worlds including one World Championship title and three second places plus ten National titles is amazing considering that one of the second places was at the Worlds last year. It is not only the OK that he has had success in with 14 national Finn titles and various top ten places at Finn worlds and Europeans as well as representing Denmark at the Olympics in the Finn." Wilcox concluded, "His constant search for the perfect rig has been the source of some humour over the years. He continues to amaze us all with his fitness and stamina and the standard joke is that the rest of us cannot retire using old age as an excuse until he does. In the meantime we will continue to enjoy his competitive spirit on the race course." Lindhardtsen accepted a small memento of the occasion. In recent years he has become somewhat of a legend in the class, although he would probably be the last to admit this. The class will induct more past and present sailors into the OK Hall of Fame in the coming months. The 2007 OK Dinghy World championships was officially opened by the Vice-President of OKDIA, Darek Kras (POL) in the presence of the Mayor of Łeba. Sunday's practice race was cancelled because of strong winds, however it is expected to moderate by Monday afternoon in time for the first points race. 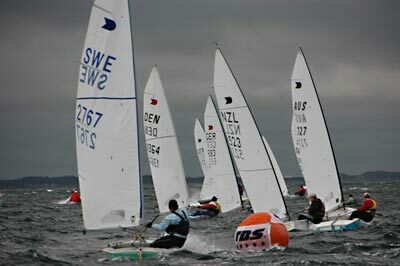 After very strong winds caused the cancellation of the practice race on Sunday, the 2007 OK Dinghy World Championships suffered a similar fate on Monday when the first two scheduled races were cancelled. The dinghy park and campsite were lashed by gale force winds all night and although the wind moderated in the morning, it was still in excess of 30 knots and just above the maximum allowable limit for the class. Although the bar and café were pleased with the extra business, the sailors sat around all day and talked about all things OK and found various ways to amuse themselves and pass the time in the picturesque marina and under perfect blue skies. A series of postponements throughout the day diminished any hopes of getting any races in and by 16.00 the PRO called it a day and abandoned racing for the day. The marina here really is the perfect setting for an OK Dinghy championship. For most sailors staying on site – about 90 per cent of them – the dinghy park, the launching ramp, the camp site, the restaurant and perhaps most importantly the bar are all within a few steps of each other and is creating the friendly community atmosphere that is traditional within the class. Sailors launch into a very sheltered marina and then have to negotiate a 200 metre long narrow canal – which can prove challenging – before being spat out to sea by the breakwater. The coastline stretches in both directions as far as the eye can see with glorious sandy beaches covered in holidaymakers. Sometimes it looks as if there is standing room only. Tonight the International OK Dinghy Association will hold its Annual General Meeting, where the two most exciting developments will be a impressive bid from New Zealand to win the chance to host the 2010 World Championships in Wellington and a proposal from Canada to be reinstated as a national member of OKDIA. After several years of development and boat building, the Canadian Association is now at a stage where membership of OKDIA is a viable option and the sailors here in Łeba look forward to welcoming Canadians to future events. The forecast for Tuesday's racing is for less wind, so it is planned to fit in three races with an earlier start time before stronger winds are due to return towards the end of the week. What do you do with 118 OK Dinghy sailors when there is either too much wind or not enough wind to be able to get in any races? Well the after sailing free beer on offer here in Łeba, Poland helps, but the sailors' frustration is very apparent as for the third day in a row there was no racing. However today, it because the winds were too light and fickle. Sailors were sent afloat at 08.30 for a 10.00 start to make up on lost ground after yesterday's opening races and Sunday's practice races were abandoned because the winds were too strong. A light but steady breeze awaited them, but after two failed starts, the easterly wind died for 90 minutes before reappearing in the west. For a while it looked good, but then it died again and then reappeared back in the east. The wind games continued and just when a course was laid, it started to die again. Another 90 minutes later it briefly appeared in the west, before coming in stronger from the south – well about 4 knots. After this started to fade away30 minutes later , the race officer finally sent the fleet home. They had been at sea for over six hours with no racing. Once on shore, the sailors were held for a further hour in case the breeze built enough to allow racing, but at 17.00 there was still only two knots on the race course, so all racing for the day was abandoned. As this report goes to press he wind is now in the north. At last night's OK Dinghy International Association (OKDIA) Annual General Meeting, the class unanimously voted in Canada as a returning member of OKDIA and accepted the bid from Wellington in New Zealand to host the 2010 World Championships. Most of the committee remains the same except that the current secretary Robert Deaves (GBR) becomes the Chairman of the Marketing Committee while Mary Reddyhoff (GBR) becomes the new secretary. In its fiftieth year the class is also looking at how it can ensure the next 50 are just as successful. Towards this end, additional items discussed included plans to look at simplifying and standardising many of the class rules, encouraging more youth and grass roots development in the class and looking at more professional marketing opportunities. The schedule for the 2007 World Championships is now becoming tight and three races per day are planned on Wednesday, Thursday and Friday. Five races are needed to make a series. The worry is that the forecast is for 30 knots on Wednesday, but the sailors are determined to go sailing come what may. Hopefully there will be some real news to report tomorrow. After the first two days were lost through too much wind and then too little, day three brought perfect conditions with three tough races completed. The day belonged to the strong New Zealand team, with Mark Perrow (NZL) taking two race wins. Second overnight is the defending champion Nick Craig (GBR). The first race started in winds of up to 18 knots and to everyone's surprise the 118 strong fleet got away first time. Mark Perrow (NZL) was the early leader, clearly finding today's conditions to his liking and leading all the way round. Nick Craig (GBR) was second at the top mark with Karl Purdie (NZL) not far behind. These three had their own race well ahead of the chasing pack. Purdie passed Craig on the second beat and on the downwind the three extended their advantage. On the final upwind nothing changed with Perrow winning from Purdie and Craig. The second race started in slightly more wind and followed a similar pattern. Most of the fleet favoured the left hand side with Perrow again leading round the top mark. On the second reach Craig passed him after the Kiwi nearly capsized on a large wave. Purdie passed Craig for a while and the three were again locked together going into the final upwind. Perrow had a slight edge in these hard conditions and took out about eight boat lengths to take his second win of the day with Craig just holding onto second place from Purdie. For the third race of the day the wind was still increasing and peaked at 24 knots, making for some tough upwind sailing through the large waves and some interesting steering downwind. The conditions off Łeba were finally living up to expectations. This time though, Craig was dominant, leading from start to finish. Perrow wrapped up an excellent day with a second, while another Kiwi Paul Rhodes (NZL) came third. For the final race, the day had clearly taken its toll with a much reduced fleet, after breakages, retirements and sheer exhaustion had set in. The fleet then had a long dead downwind sail to the safety of the harbour to contend with. With the wind still increasing to nearly 30 knots, this was an exhilarating end to a tough day, and it was some time later that the support fleet had managed to sweep up the stragglers and upturned hulls and bring the full complement of sailors back to the marina. After three races Perrow has a one point lead over the defending champion Craig, with Purdie a further six points behind. 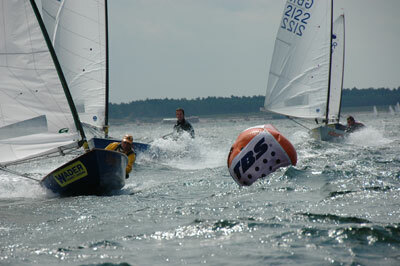 Three more tough races were today sailed at the 2007 OK Dinghy World Championships in Łeba, Poland. Two wins and a third place for defending world champion Nick Craig (GBR) were enough for him to take a seven point lead going into the final day. With most of the fleet still aching after yesterday's three races in strong winds, today, Thursday, three more races were sailed in slightly lighter winds. Race four got underway in a solid 15-16 knots with the left side again favoured. Karl Purdie (NZL) made the best of the first beat to lead round the top mark while top two overnight, Nick Craig (GBR) and Mark Perrow (NZL) were further to the right. Craig spent most of the race in fourth place, but climbed to third on the final beat. Jorgen Lindhardtsen (DEN) sailed his best race so far this week to place second, while Purdie took the race win. Race five was sailed in slightly less breeze, which on the second round dropped to around 7-8 knots for a while. Craig started near the pin and soon crossed the fleet to the left to lead round and record his second win of the championship. On the second upwind, when the wind went very light for a while it heavily favoured those on the right hand side. Andre Blasse (AUS) made steady progress through the race to place second while Perrow recovered from an average first beat to place third. The wind picked up again to about 12-14 knots for the final race, and a big left hand shift on the first beat brought Gunter Arndt (GER) and Jon Fish (GBR) round the first mark in the lead. However Craig was not far behind and was soon in the lead to win his third race. Karsten Hitz (GER) finally found the form that won him two world championships to move up to second, while Terry Curtis (GBR) who led round the second upwind mark placed third. Going into the final day, there are three more races planned, with a wind forecast similar to today. Craig is looking good to win the title for the third year in row, although there are several sailors behind him determined not to let this happen. Realistically Craig only needs two top three places to assure himself of the title, and with his worst result so far as fourth, the odds are in his favour. But tomorrow is another day. 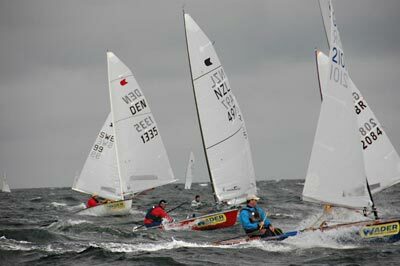 In Łeba, Poland, Nick Craig (GBR) won his third consecutive OK Dinghy World Championship after scoring a second and a first in extreme conditions that tested all the sailors to the limit. The fleet set sail this morning to the sound of a passing thunderstorm and of a loud rock band practicing on shore. An hour postponement to allow the wind to settle was followed by the first start in around 8 knots of wind. The forecast was for it to go right, and half way up the beat this happened in dramatic style. The wind veered 10 degrees and increased by 10 knots in a matter of minutes. Those on the right just got richer and it was Thomas Hansson-Mild (SWE) leading round the top mark from Jorgen Lindhardtsen (DEN). Unfortunately Hansson-Mild broke his tiller and by the time he had fixed it was well back down the fleet. Lindhardtsen led round the bottom mark after the wind increased to some 25 knots. The next beat was the decider with Mark Perrow (NZL) taking the lead on a gruelling upwind leg in the still increasing wind and larger seas. Event leader Nick Craig (GBR) managed to pass Lindhardtsen and moved up to second and the places stayed the same on the run. Interestingly Craig was the only boat in the top five to attempt the gybe. Most of the fleet wore round. However, Perrow led up the final beat, with Craig second and Lindhardtsen in third. The second race started in 20 knots and proved to be even more of a test for the sailors. Craig proved what world champions are made of and led out of the start to the right side before coming back to cross the fleet and lead round the top mark. Perrow took the lead on the screaming first reach but broke his tiller and was forced to retire. 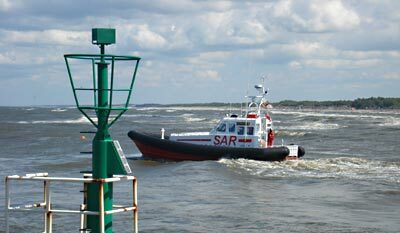 At the gybe mark, most of the fleet could not see the buoy in the massive waves and again most of the fleet tacked rather than gybed in the extreme winds. The next beat and run were hard work for those that remained afloat or upright but Craig proved why he is world champion by winning the race and the championship in style from Andre Blasse (AUS) and Karsten Hitz (GER). This championship has been one of the most open for a number of ears with five nations in the top ten. In the top 20 there were six from New Zealand, clearly showing form in the breezy conditions as well as four from UK, three from Germany and two from Denmark. When Craig receives the world championship trophy tonight he will be only the second person in the 50 year history of the class to win the title three years in a row. From 1991-1993, Bo Staffan Anderson (SWE) won three of his four world titles. Craig is now in a position to rewrite history at the world championships next year in Warnemunde, Germany.